I couldn't tell you how many times Tessa cried herself to sleep as a baby. Nap time and bed time were equally excruciating affairs. She never did go down easy. Most nights, Livvy, on the other hand, gratefully accepts her bedtime stories, a minute or two of rocking, and a microwaved bottle before I settle her into her crib, where she goes soundlessly off to sleep. There's a splash of amber around each pupil, but Tessa's eyes are mostly the color of the ocean, where it's shallow enough that you can look down and see your feet, all shifty and mottled on the sand beneath you. Livvy's irises, meanwhile, are deep and brown, through and through. Tessa is the sea, and Livvy is the land. Livvy's hair is only now beginning to really come in. At 17 months old, she has a wild, if patchy, little afro that I can't imagine will be long enough to pin into a ponytail any time soon. Tessa Jean, now age four, had hair to spare very early on: outrageous, tangled tufts. Tessa was passionate about her pacifier, Livvy never would take one. Livvy nursed happily until she was a little over a year old, but I couldn't make it work with Tessa. They have similarities that I've noticed, too--both are opinionated, both have sturdy, long bodies, both are preposterously picky eaters. Their skin looks to be the same tawny color. If their skin had a taste, I think it would taste like an iced caramel macchiato on a hot day. For all the ways that my girls are alike, it's the differences that make me uncomfortable. It's the way I am forever comparing them--physically, developmentally, intellectually, emotionally. They are not meant to be compared. 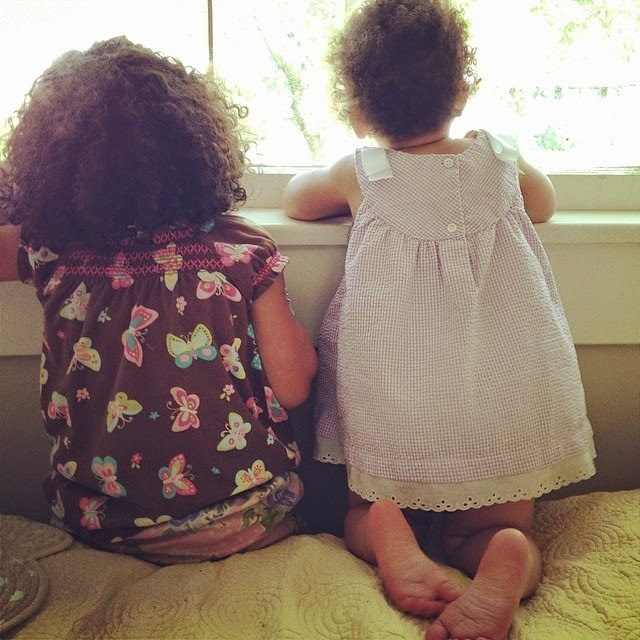 They are two little human beings who, it just so happens, will go through this life as sisters. And with me as their mother. A week or so before Livvy was born I asked Facebook how I would ever love another baby as much as I loved Tessa. I asked parents of two or more kids for reassurance that I could. The responses came immediately. There were a lot of them. They were thoughtful, sure, but also full of platitudes about how my heart would double in size instantly. I did love Livvy right away. And I felt a wild-animal kind of protectiveness. And welcoming a second child, though hard, was much less anxiety-provoking for me. But for my heart to grow into the big, pulpy, pulsating mess that it is for Livvy today--for it to be anywhere near as intense as the love I'd developed for Tessa (who had a two-year-and-eight-month head start), that has taken some time. For me, real love--even for a child of my own--is hard-fought and hard-earned. I have to really know you to love you, and if you ask me, you can't really know a baby. You can know that they go down for their naps at 10 and 2, that they smile when you blow raspberries on their bellybutton, that they have your husband's lips and a birthmark on their bottom. You can know that just looking at them makes you so proud that your heart cartwheels into your throat. But who can pretend to know much more about their infant than that? My feelings about motherhood were somehow simpler when I had one child, boiled down as they were to my experience with just Tessa. And of course the first child is the first everything. And you know what they say about first loves. I've discussed this with a few friends who have more than one child. Most don't quite seem to understand why it's taken me longer to become enamored of my second child; if anything, they say they felt more tenderness more quickly toward their younger children. Some moms I've talked to have a boy and a girl and say it's probably easier not to compare children when they're different genders. Maybe it's that my love isn't prolific enough. I'm an only child, I'm only close to one of my parents, and I have only ever had one real boyfriend, now my husband. Maybe it's just that I'm not a baby person. The younger my kids are the more stifled I feel, the more overwhelmed I am by how little I know this person who I have signed up to love and care for for the rest of their lives. I am more exhilarated by my children's autonomy than by their vulnerability. Or maybe the way I felt is the way that a lot of people feel and have felt since the beginning of time. Maybe people say that your heart doubles in size when you add another child because they don't know how to say that what actually doubles are the number of feelings you have. Feelings that are frightening because they are so beautiful and so ugly. They are so human. I work hard not to compare Livvy to Tessa, but sometimes, especially at night when I am in her room rocking her and she gazes up at me through the filtered darkness, heavy with trust, I feel clenched with anxiety and so I put her quickly into her crib and leave her there in the quiet. What is this about? I think it's that my love doesn't feel good enough for someone who is as good as Livvy. My heart didn't double in size when she was born, it divided, and parceling it out is painful sometimes. It is not a perfect love--not the love I feel for either of my children--but is some of the best I have known. I want to get better at it. I want my heart to do what they say it should--to grow. I want a heart as big as my daughters'. I want the heart I had when I was a little girl, when love was simple. I totally understand that feeling. As a father, I have a hard time feeling that complete love for my children, especially in the first 6 months. Lou took even longer for me. But life is not a picture, it's a movie, with rising and falling actions, protagonists and antagonists. Love is the same way. You will look back on this post and laugh someday I promise. Livvy is a great soul and Tessa is a great soul and just as you try not to compare the two you should not compare your love for the two either. Nek--This is the most beautiful thing that I've read that you have written! Stop worrying your little self about this issue too much! Stop beating yourself up, my child. Accept your feelings--then they will dissipate and return, dissipate and return. I think that the important thing is that you love them both well--as well as you can at any given time. There will be an ebb and flow to this emotion that we call love; sometimes you will connect more to one child than to the other. But they will each know that you are there for them in the good and bad times. Just enjoy/appreciate each of them in the fleeting moments that we call life. What more can a parent do? I don't think you will ever love them the same. I don't love mine the same. The love rises and falls. one day I'm more in love with my son, then next it's my daughter. What matters is that I love them both, equally LOVED.